Your home furnishings require regular care and maintenance to extend their life and keep them looking beautiful year after year. Protect your investment in your furnishings—rugs and carpets, furniture and upholstery, and window treatments and drapes—by performing routine cleaning and upkeep according to the manufacturer’s directions. This keeps your home fresh and your furnishings looking clean, and also reduces dust and allergens in the environment. Have more thorough deep cleaning done on a regular basis by professional cleaners. Clean up spills such as wine and food from rugs and furniture as soon as they occur. Don’t let them dry into the fabric or pile as they will be more difficult to remove later on. Blot spills gently using a clean towel. Before spot cleaning with a new product, test the product in an area of the carpet or furniture that is inconspicuous, and always check the manufacturer’s instructions so you don’t void the warranty. Remove loose dirt from leather and fabric upholstery and cushions with a small brush. Vacuum rugs, carpets, furniture, and drapes weekly to remove surface soil and prevent it from becoming embedded in the fabric. Regular vacuuming also helps reduce the amount of allergens such as pet dander and dust from your furnishings. Leather furniture requires special handling. Follow manufacturer’s instructions, as there are different types of leather. Regular cleaning of leather furniture requires wiping it down with a soft cloth weekly and also vacuuming the furniture occasionally. Clean spots or stains using a gentle cleanser to wipe the stain off—never scrub. Rotate rugs 180 degrees at least once a year. Flip loose furniture cushions periodically. Some upholstery and fabrics, including silk and other delicate fabrics, fade from too much sun. Rugs with fugitive colors are equally sun sensitive. When possible, protect fabrics from direct sunlight for extended periods of time. In-home furnishings such as upholstery and drapes can easily absorb smoke and fumes. While not always possible to avoid air contamination from these types of pollutants, make sure you have proper ventilation to extract as much smoke as possible, which helps control odor. Make minor furniture repairs such as reattaching loose buttons and fixing fabric tears. Remove pet hair from furniture using a bristle brush or clothing lint remover. Some pet stores sell brushes or tools specifically for removing pet hair. While you can extend the life and beauty of your home furnishings by following these routine cleaning and maintenance tips you can perform in your own home, don’t rely on them exclusively. 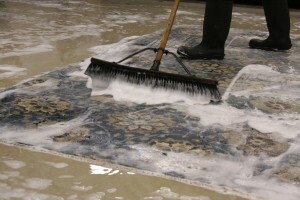 You can also get to know why you need to hire a professional carpet cleaner. Call Rug Renovating Co. when you’re ready for a more thorough, professional cleaning of your rugs, carpets, upholstery, and drapes.